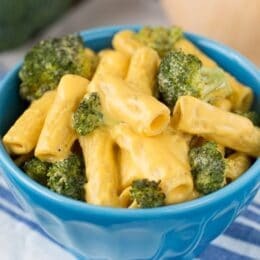 Butternut Squash Alfredo recipe with rigatoni pasta and broccoli! 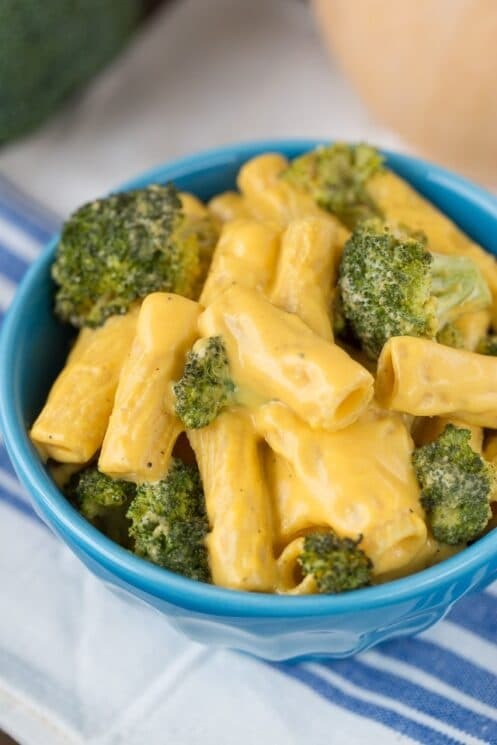 This meal will win over any kid and it’s perfect for fall! Fiber, which kids are always in need of increasing for digestive health. The first step of this delicious butternut squash recipe is to roast the squash and the broccoli. Roasting really brings out the flavor and softens the veggies for later blending. Never be afraid to add more veggies! 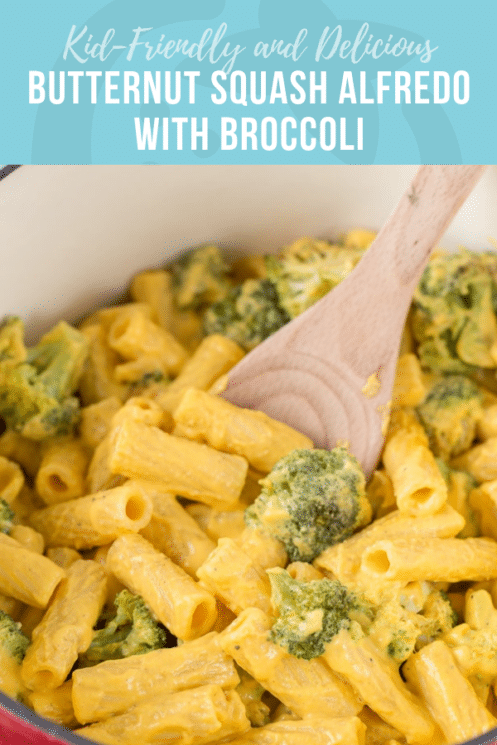 This recipe calls for squash and broccoli, but you can definitely add additional veggies or swap some out. Some suggestions would be sauteed onions, bell peppers, mushrooms, kale, or Brussels sprouts. Even adding a protein like chicken could really take this up a notch! Don’t be afraid to experiment and add even more health benefits to every meal! I cubed my squash to bake, but you can also bake it on the skin in pieces and then scrape it out once it’s cooked! Do whatever you find easiest. 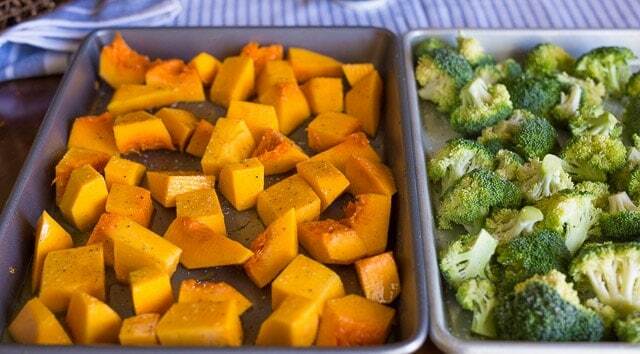 I roasted my broccoli on a separate sheet pan just in case the broccoli cooked a little faster than the squash. The second step is to cook your pasta. The main difference between white and whole wheat pasta is in the processing. Whole wheat contains three parts of the grain—the bran (the grain’s outer layer), the germ (the sprouting section of the seed), and the endosperm (the large starchy center). During processing, the heat forces the nutrient-rich bran and germ out of the grain, leaving just the endosperm behind. What is left generally has a longer shelf life, not to mention a cheaper price tag, but it is considered nutritionally weaker. 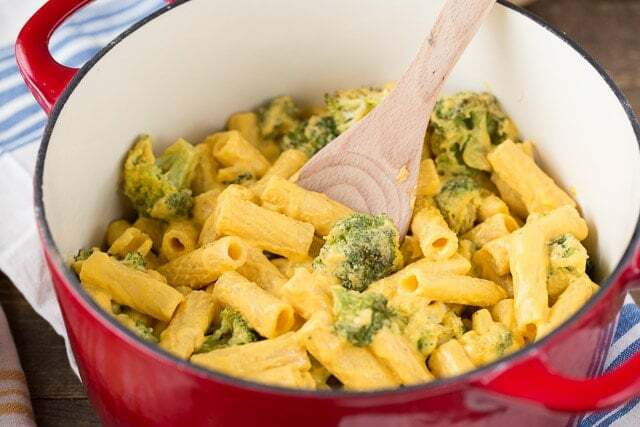 Most pasta is fortified adding back some of those nutrients that are lost. Getting used to the taste and texture of whole wheat pasta may take a little time, thanks to its strong, nuttier flavor and more grainy consistency. But following the suggested cooking will ensure the noodles don’t get too gummy and start sticking together. With the right sauce or topping, adding whole wheat pasta is an easy way to enjoy a healthy meal. The final step is the sauce and putting it altogether. 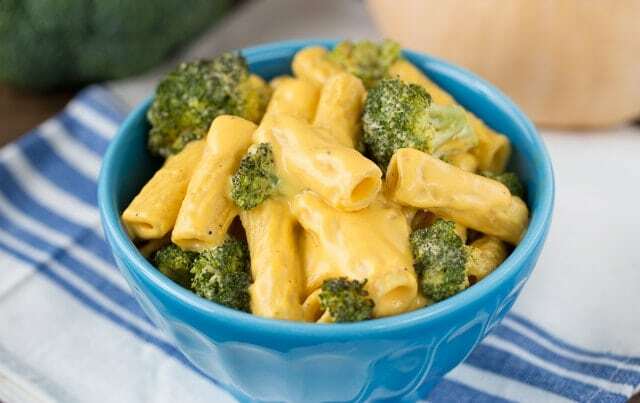 Making a creamy milk sauce on the stove and then blending it with the butternut squash gave us the sauce to top the broccoli and pasta. We blended the butternut in a blender and then poured it on top! This butternut squash recipe is so delicious and a great way to get your kids to enjoy eating winter squash. If you want more recipes with Butternut Squash, these are the most popular ones on our site! Preheat oven to 400 degrees. Cut butternut squash into 1 inch cubes and place them and broccoli florets on a cookie sheet. Drizzle with olive oil and salt and pepper. Bake for 20 minutes. While your veggies bake, cook pasta and drain out water. In large pan over medium-high heat add butter and garlic. Let melt. Add flour and whisk in until smooth. Cook for 2 minutes and then add milk and bring to a boil. Stir occasionally. Add nutmeg and cheese and stir until smooth. In a blender, add milk mixture and cooked butternut squash. Blend until smooth. Pour over cooked pasta and stir until coated . Add broccoli and serve! Can I baked the butternut squash a day early? And refigerate then blend next day? Or do I have to bake it the day I’m making it? That is totally fine! You’ll just need to reheat the sauce! Thanks for a great recipe! My picky kids didn’t complain last night at dinner! Love hearing this Jenah! Thanks for sharing.